Rachel: Hi. I'm Rachel, and I'm a happy patient of Dr. Kirk Moore. I actually heard an ad on the radio. I had already been thinking about breast augmentation, and so I called and scheduled an appointment. When I scheduled a consultation, everybody was super nice. I came in, and everybody was super polite and helped me understand exactly what I'd be getting into. All the questions that I had were answered. It felt painless already. I did not know Dr. Moore's exact procedure, but when I came in for consultation, when they showed me all the different options that I had, I was very interested in the shape. That was my favorite, because I'm a mom of three kids and I wanted to just look like I did before children. After surgery, I was out and about doing things by the next day. I played it cool that day, but I could have done anything minus lifting a lot of weight. You don't want to do that. But, I felt fine other than you can't use your arms. I was actually never too swollen to wear clothes, or I never felt uncomfortable that way. I was a little tight, and I did my stretches. Other than that, everything went great. 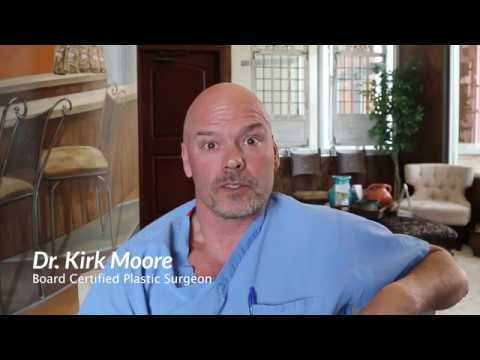 Dr. Kirk Moore is a great choice for breast augmentation. I felt great with his staff, I felt great with him. My results are perfect. It's exactly what I expected per what they told me in my consultation. I'm very happy with my result. I don't even own a bra anymore. I am completely happy with everything that he did.